Recreate the excitement, pace and skills of a real football match with this great table top football action game. It features magnetic actions, each of the players can pass, shoot or trap the football. Board game information: Contents: includes two diving keepers, two power strikers and two free kick takers. 1 or more players. General information: For ages 6 years and over; As seen on TV; EAN/MPN/UPC/ISBN: 5020674936004. WARNING(S): Not suitable for children under 3 years old. 4 Questions 4 Answers Recreate the fast paced excitement of a real match with Total Action Football. Budding David Beckhams and wannabe John Terrys can enjoy an action-packed kickabout without ever leaving the house thanks to this fantastic table football kit. Magnets give you total control over your play as you pass, trap and shoot the ball. Take corners and free kicks using specially designed ‘free kick takers’ and make diving saves with the goalkeeper. 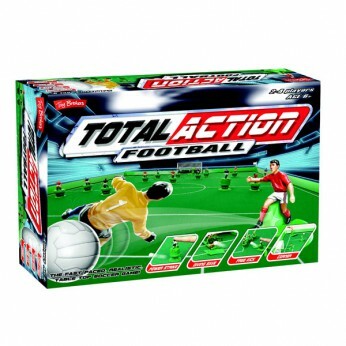 Total Action Football comes with everything you need to get playing straight away including 2 magnetic footballs and 2 teams of 11 ‘players’, each with 1 keeper, 1 free kick taker and 1 power striker. A playing mat, goals, corner flags and a full perimeter barrier make easy work of setting up the 70cm x 95cm playing pitch. Suitable for kids aged 6 and up. This toy costs approximately £24.99 (for the latest and best prices make sure you check our retailer list for the Total Action Football above). In our review of Total Action Football we classed it as being suitable for ages 6 years, 7 years, 8 years but recommend you check the manufacturer specific advice before purchasing.